Red, white, and blue is my favorite color combo because you can use it all year long and it always works! My stars 4th of July quilt was is starting to look ragged after 7 years, so I started this quilt as a large throw size and keep on our couch. After the 4th of July came (and went) before I finished it, I changed my mind and decided to make this a little larger than a crib size and donate it. I backed this one with a double sided minky and left out the batting. 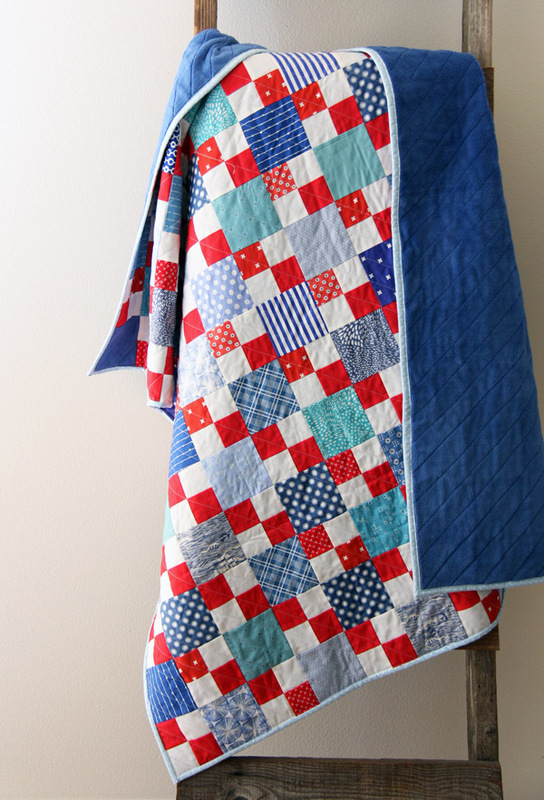 I have two other quilts I’ve done this with and they’ve held up really well to years of use and washing. It’s nice and light, but the downside is the blue backing slightly shows through the white fabric on the front…probably not enough anyone would notice, but the white does have a slightly blue hue. 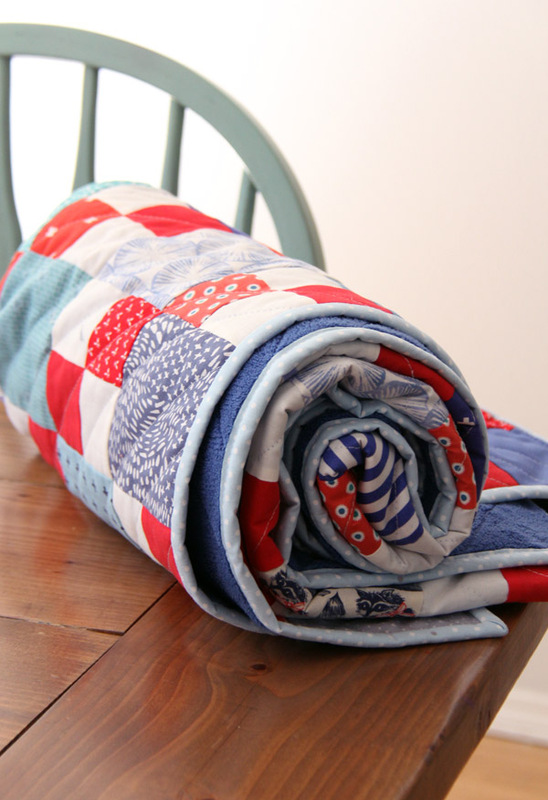 I did a post years ago about how prepare and quilt a quilt using this backing you can read here. Also for those who asked, I don’t pre-wash my minky before quilting with it! I used the Scrappy Summer pattern to make the top, but with only two colors like this you can also just alternate four patches and squares. If you have the pattern, I made a size in between the crib and the throw, using 42 blocks. There is also a less detailed tutorial for the blocks you can find here. You guys I DROPPED my nice camera yesterday. Onto the hard tile floor…smashing the lens completely. Boo. Luckily after I removed most of the broken glass it can still take pictures…I just can’t ever take the lens off. So if you see tiny blurry bits in my photos from now on you’ll know it’s shards of glass…no big deal LOL. Very pretty! I’ve wondered about using a minky backing, thanks for the info. And so sorry about your camera. Some lucky person will have a wonderful snuggle quilt, the minky is yummy! Big ‘ole bummer about the camera, the upside is that it still works! Ha! I was thinking minky would show through the white! I’ve been sticking to white and off-white minky (borrrring) because I was worried about my white backgrounds turning pink and green and blue. I love your double-sided-minky-fleece-no-batting trick and use it a LOT. 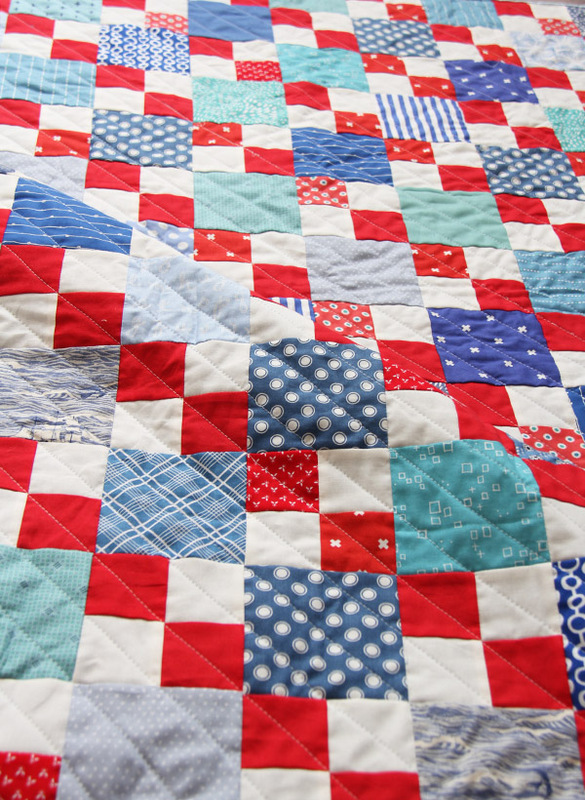 Doesn’t it make for a nice squishy floppy comfy quilt? Yes it does make for a nice soft quilt! They are the only ones my kids will use! It doesn’t turn it blue enough that anyone else would notice I don’t think…I’m just used to the white batting behind the quilt top! I love anything 4th of July-ish and this one is no exception. It’s darling! The idea of double minky & no batting is brilliant! LOVE the quilting, too. I love it in the two colorway. Such a cuddly quilt! So sorry about your camera – maybe Christmas will come sooner than you think ;)! so sorry to hear about your camera but that’s a bit of luck that it still works. The good ones are really expensive ! Another beautiful quilt and so generous of you to donate it to some lucky recipient. I have to tell you I had an ah – ha moment while reading your post and it has to do with you mentioning ‘double sided minky’. I made your Woven Quilt pattern ( for the second time ) and decided to back it with minky and then was wondering why internet friends oooh and awww about this – well, mine wasn’t double sided and felt a bit thin. Oh well, I’ll know for next time. Thanks for mentioning it. I’ve had many of those “ah-ha” moments! I bought this minky at Joanns and I think it even says on the label on the bolt that it’s double sided. I’ve bought the wrong kind many times! So sorry you dropped your camera! I hate it when I do things like that! Your quilt is cute. I like red, white and blue, too. This is so very pretty…Love the colors….Beautiful Quilt…. Love the color and fabric combinations! Very pretty! 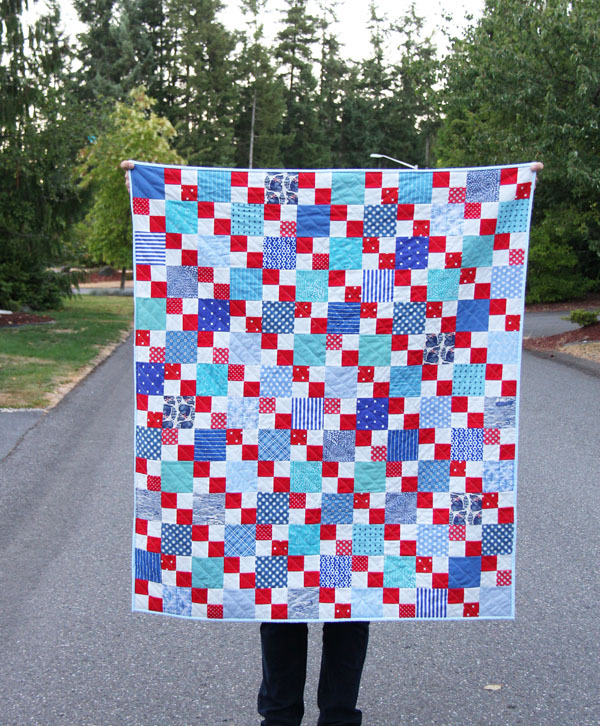 I love this red, white and blue quilt! It’s too bad about your camera! Lovely quilt that will make someone really happy. Sorry, you had that unhappy moment with your camera. No idea what a good solution could be but praying there will be one – and if it is just that it will keep taking great pictures. Oh no!! So sorry about the camera! I could totally see myself doing that. Doh. Love the quilt though! Red, White, and Blue always looks good. I started reading your blog when you were pregnant with Sophie! Time gives by so fast (my Kids are 21and 23!). Enjoy these years. They were my favorite! You and I were pregnant at the same time when you had Sophie. My girl is the end of the line around here and she just started school last week. Yay for more sewing time, boo to babies getting bigger! So sorry you dropped your camera–I know that sick feeling as you see it falling…ugh! glad it still works for you. I had to get a new one–which I love, but still. Not fun. How exciting that your last baby is in school now!!! Time sure flies doesn’t it?